Airbrush artists can paint on literally anything, giving you the opportunity to provide a memorable party favor for your guests. From t-shirts to beach towels, hats to sweatpants, our airbrush artists craft masterpieces specifically designed for your guests. 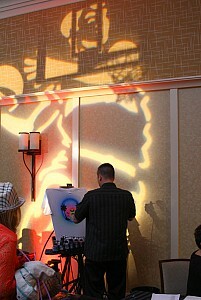 We can also provide artists for airbrush tattoos, and our packages always include an attendant to keep the line moving.